To fight and conquer in all your battles is not supreme excellence; supreme excellence consists in breaking the enemy’s resistance without fighting. Thus the highest form of generalship is to balk the enemy’s plans; the next best is to prevent the junction of the enemy’s forces; the next in order is to attack the enemy’s army in the field; and the worst policy of all is to besiege walled cities. This week’s featured articles: The Summer of Snowden I: language of denial and A brief meditation on white twerking. Saturday, the Syrian government agreed to the Chemical Weapons Convention, and the US and Russia agreed on a plan to eliminate Syria’s chemical stockpile. If the plan works, then the Obama administration will achieve one of its main goals in Syria without using force. As I wrote last week, though, American motivations in Syria have been muddled. So you should be happy if what you mainly wanted was to uphold international norms against chemical weapons. If, on the other hand, you wanted Assad overthrown, this plan won’t do that. The civil war in Syria, with all its civilian casualties and displaced people, will go on. If you just wanted America to stay out of a situation that doesn’t seem to have any clear solutions, you should be ecstatic. On the issue of threatening war and then stopping short of it: WaPo’s Dylan Matthews collects historians’ work on how important it is for a world leader to follow through on his threats. Not very, it turns out. Paul Huth (now at Maryland) and Bruce Russett (Yale) analyzed 54 historical cases and concluded, “deterrence success is not systematically associated…with the defender’s firmness or lack of it in previous crises.” … The University of Washington’s Jonathan Mercer’s book, Reputation and International Politics, finds that there is no predictable effect of backing down in crisis. When Iran’s leaders are trying to figure out if we’ll really mess with them if they interfere with tanker traffic in the Strait of Hormuz, they’ll ask, “Does the U.S. really care about global oil flows?” and “Can the US Navy really keep those sea lanes open?”, and the answers are “Yes, we care deeply,” and “Yes, the Navy can,” It would be foolish in the extreme to think that our willingness to intervene in a civil war in which we have no allies and no friends is a good indication to how we’d respond to attacks on genuine national interests. The weirdest part of this whole story has been the reaction of American conservatives, who somehow see Putin getting an advantage over Obama. Whose ally is giving something up? I guarantee you, if Putin had threatened war unless Israel gave up some kind of weapon, and Obama pressured Israel into promising to do it, conservatives would not be saying Obama had gotten the better of the deal. Steven Benen summarizes in “Revenge is a dish best served coherent“. 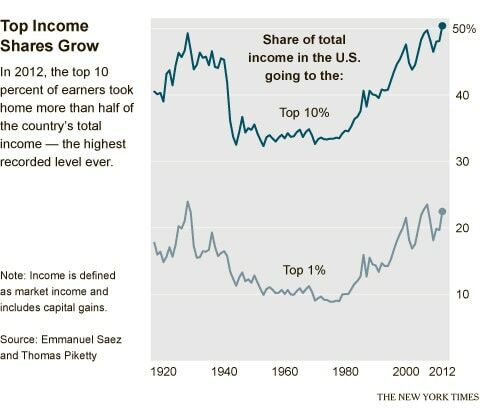 New numbers from economists Saez and Piketty show what you probably already suspected: The vast majority of the income gains from the post-2008 economic recovery have gone to the wealthy. The WaPo’s Wonkblog has a great set of graphs explaining “how everyone’s been doing since the financial crisis”. The short version: bankers, corporations, and the rich are doing fine; workers and families not nearly so well. This week begins a series I call The Summer of Snowden. Part I of the series examines what the NSA’s words really mean. 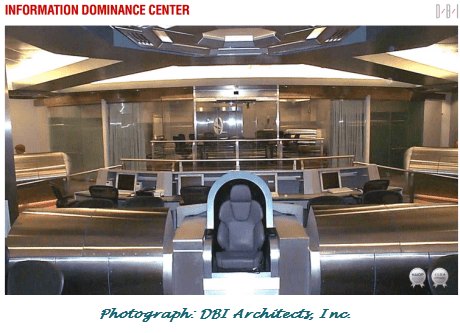 designed by a Hollywood set designer to mimic the bridge of the starship Enterprise from Star Trek, complete with chrome panels, computer stations, a huge TV monitor on the forward wall, and doors that made a “whoosh” sound when they slid open and closed. Well, at least it’s not the Death Star. The next Fed chair won’t be Larry Summers. As Treasury Secretary under Clinton, he championed the financial deregulation that prepared the ground for the Crash of 2008. And as President Obama’s first Director of the National Economic Council he was one of the architects of the save-Wall-Street-first strategy. So I’m not sorry to see him shuffle off the stage. I’ve had a policy of avoiding outrage-of-the-day articles, so I’ve barely mentioned Pat Robertson or Glenn Beck at all lately. AlterNet’s Amanda Marcotte makes the case for covering them more closely, because otherwise they get to maintain one image for the general public and another for their followers. There’s a widespread and concentrated effort on the right to keep the crazy talk as far out of sight of the opposition as possible, while simultaneously disseminating their ideas among the true believers. This reality doesn’t comport with the claim that they benefit from mainstream media attention, but the opposite. The last bit about being deliberately two-faced when being a conservative talking head–that’s precisely what the anti-evolution crowd does. One face talks to mainstream media and sounds ever so innocuous. The other face fundraises amongst the far right, saying very different things. They’ve lost some court cases because somebody actually watched and recorded what they said on right-wing TV shows.